1080p Full HD Video Converter – Convert High Definition MP4 MKV AVI 1080p to 720p on Windows (10). 1080p, this term usually assumes a widescreen aspect ratio of 16:9, implying a resolution of 1920x1080 (2.1 megapixel) often marked as Full HD. Although there is an escalating trend for 4K videos, the streaming, uploading and downloading speed is extraordinary slow due to the enormous size of 4K videos. For example, to download 4K video (an half hour) maybe needs one hour which is quadruple even quintuple times than downloading a 1080p HD video. Therefore, under the current circumstances, 1080p is still the mainstream video's resolution. Moreover, except the AVCHD videos recorded by digital camcorder and the HD camcorder videos, the Blu-ray Video (*.mts, *.m2ts), HEVC/H.265 (*.mkv), Matroska Video (*.mkv), etc are all supporting 1080p resolution. Still, iPhone 6s is 2000-by-1125 pixel resolution at 488 PPI, iPhone 6s Plus is 2208-by-1242 pixel resolution at 460 PPI, iPad Air 2 is 2048-by-1536 pixel resolution at 264 PPI, accordingly, watching HD videos on these portable devices is a feast for the eye. 4. Compressing and converting 1080p to 720p for Email, or for fast uploading video to YouTube, Facebook, Dailymotion and other video sharing sites. Then you need a 1080p to 720p converter - VideoProc. With the fastest transformation speed, highest conversion quality and versatile customizable settings, this omnipotent HD video converter enables you to lower 1080p videos' resolution to 720p, 480p for your own sake, or you can also convert HD video, download 1080p HD videos then switch them for playable on your own utilities. VideoProc - An all-in-one 1080p HD video converter, which can help you convert any 1080p 4K HD video to your desired resolution and upscale video to 1080p for playback perfect on any of your mobile, TV devices etc. -With 370+ built-in video & audio codecs, you can rest assured that all kinds of standard 1080p HD videos can be unexceptionable converted and compressed to fit your media players or portable devices in an easy way. Say, you are able to convert HD video from 1080p to 720p, or shift UHD videos resolution from 4K to 1080p, 4K to 720p and so on effortlessly. 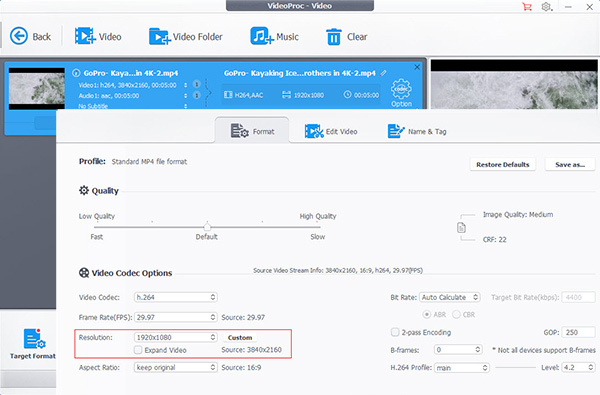 In detail, launch VideoProc, then add your 1080p videos by clicking the first or the blue icon, after this HD video converter have finished analyzing, an output profile window will automatically pop up. At this moment you are suppose to choose your desired resolution and format like 1080p to 720p, MP4 to AVI. What's more, you can also change resolution by tapping the Setting button which is located at the right side of the conversion interface. Plus, this 1080p to 720p converter provides the selectable resolution with 1920*1080 (1080p), 1280*720 (720p), 1920*1200, 1280*800, 960*640, 720*480, 640*480, 480*320, 320*240, or you can customize it optionally; and the aspect ratios are 16:9, 4:3, 3:2 or keep origin. Luckily, the frame rate and bit rate are also alterable. -The feature to support multi-core CPU of this HD video converter allows you to take full advantage of up to 8 Cores to maximally increase the processing speed. The improved configuring for i5 i7 CPU, the optimized AMD 3DNow! and Intel SSE3 SSE2 MMX Instructions deliver a 83x faster real time converting speed. - This smart HD video converter supports 410+ built-in preset device profiles and over 320 video codecs & 50 audio codecs. It supports to convert 1080p to 720p, 4K to 1080p, AVI to MP4 and vice versa. The detailed information are as follows. High Definition Video: 1080p AVCHD Video (*.mts, *.m2ts), H.264/MPEG-4 AVC (*.mp4), HEVC/H.265 (*.mkv), MPEG2 HD Video (*.mpg; *.mpeg), MPEG-4 TS HD Video (*.ts), MPEG-2 TS HD Video (*.ts), Quick Time HD Video (*.mov), WMV HD Video (*.wmv, *.xwmv), Blu-ray Video (*.mts, *.m2ts), HDTV Video (*.ts), Matroska Video (*.mkv), 4K video. HD-Camcorder Video: JVC HD camcorder Video(*.mod, *.tod), Sony HD camcorder Video(*.mts, *.m2ts), Panasonic & Canon HD camcorder Video. Other regular video: MP4, MXF, AVI, MPEG, WMV, FLV, F4V, H.264, DivX, XviD, MOV, etc. Photo & Picture: JPG, PNG, BMP. Video to Video: MP4, AVC, AVI, WMV, MKV, MOV, MPEG1, MPEG2, RM, 3G2, 3GP, MOV HD, AVC HD, MKV HD, AVI HD, etc. 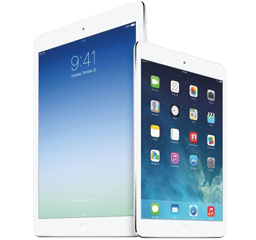 Video to Device: iPhone 6s/ 6s Plus, iPhone 6/ 6 Plus, iPad Air 2, iPad 4, iPod touch 1-5, Apple TV, iTunes, Air Playit, HTC, Samsung, Google(New) Nexus7, PS3, PS Vita, etc. Video to Audio & Image: MP3, AAC, AC3, WAV, ALAC, PNG, etc. The embedded High Quality Engine and "Yadif Double Frames" De-interlacing Engine can optimize image quality dynamically, reduce noise and adjust definition to make the output video more clear. On top of that, all bitrate and resolution parameters are regulable to balance the video quality and the file size. With advanced Online Video Download Engine, it enables you to download sharp 1080p, 2160p/4K videos and pop MVs from YouTube, Yahoo, Facebook, DailyMotion, Vimeo, Vevo, Break, MTV, Pandora, CBS, CNET etc. over 300 online video sharing sites in 30 seconds. You only need to click the URL button and then tap paste & analyze button to start downloading. When the download is complete, go to add it in the interface and convert these HD videos or UHD videos to AVI, MPEG, WMV, MOV etc. for offline playback, further editing or DVD creation. VideoProc delivers fast speed, excellent video quality and effort-saving operating, to help you convert 1080p HD videos to 720p, 4K to HD videos, 1080i to 1080p, AVCHD M2TS to AVI or any other resolution and formats you desired breezily. As one of the top 3 fast video converters, it provides you with the 3x-5x faster than that of other HD video converters due to the support for level-3 hardware accelerated video encoding and decoding powered by Multi-core (up to 8) Intel® CPU, NVIDIA® and AMD® and other cutting-edge technologies. Except video's resolution, it also support for converting HD videos to 410+ different output profiles which is facilitate to play your favorite videos on varies digital devices. With feature-rich custom settings including adjust audio volume, add subtitle, crop & expand, trim, snapshot and change resolution, batch conversion function, this 1080p to 720p video converter can offer you more experience and possibility which are beyond your imagination. How to Convert 4K video to 1080p with this 1080p HD Video converter? Step 1. Access to Video control and click "+ Video" buttn to load a 1080p video. Step 2. Choose output video format and click the Gear button to adjust settings: resolution, codec, bitrate, etc. Step 3. Choose the resolution 1280x720, then click "OK" to save the change. Step 4. Click "Browse" button to choose a destination folder for the converted file. Step 5. Click "Run" to start converting 1080p to 720p. That's it! Simple yet effective. Need a free DJI video editor to start your first drone video editing or want to know the best DJI video editing software for PC/Mac used by most people? Here is the full list. This video joiner free download guide helps you get the best video joiner to merge multiple videos in any format (MP4, AVI, MKV etc,) into a single file on PC/Mac. The best 1080p to 4K converter makes your 1080p videos perfectly compatible with 4K displays and 4K-supported sites.